Loose, sagging skin and stretch marks are two common complaints from women, especially as the skin ages. As aging skin loses its elastic properties and collagen production slackens, the effects of gravity become more apparent. Stretch marks are tears in the skin fibers that are caused by pregnancy, puberty or gaining weight. The skin stretches quickly, causing a depression in the skin that is characterized by jagged pink, white or purple lines. 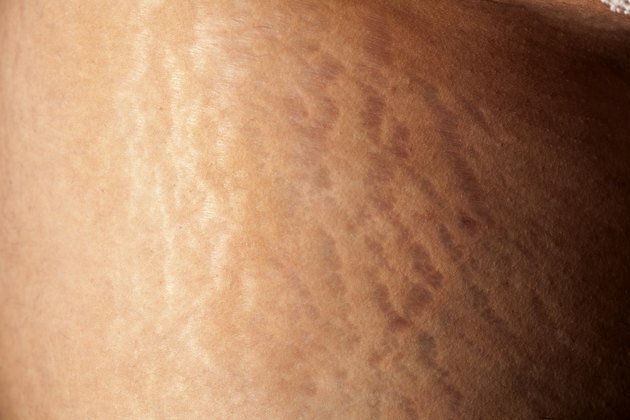 Stretch marks and loose skin can be treated with home folk remedies, although there is little scientific evidence to prove the efficacy of such treatments -- only anecdotal evidence. Rub the affected area two times per day with pure cocoa butter. Choose a cream that is 100 percent cocoa butter and look at the ingredients list to check. Some cocoa butter creams only have a small percentage of pure cocoa butter. Break two vitamin E oil capsules into 2 ounces of a nourishing carrier oil, such as olive, almond or wheatgerm oil. Rub the oil on your stretch marks daily. You can also take vitamin E capsules internally, following the directions listed on the packaging. Mix ¼ cup of aloe vera gel with ¼ cup of olive oil to make a stretch mark gel. Massage your stretch marks with the gel daily. Whip one egg white until it is frothy and stiff. Dissolve ¼ teaspoon of vitamin C crystals and 1 tablespoon of pectin in 4 ounces of distilled warm water. Add the egg white to the liquid and mix. Massage your face with the skin tightening mixture and cover you face with a warm towel or pieces of gauze. Keep the mask on for 15 minutes and rinse with warm water. Pat your skin dry. Add 1/4 cup of apple cider vinegar to warm bath water to tone and tighten the skin. You can add a few drops of essential oils such as lavender, clary sage or geranium to mask the smell of the vinegar. Squeeze 1/2 of a lemon into a cup of cold water. Splash the water on your face after you have washed it and do not rinse off. Let the lemon water air-dry on your face. Combine 1 teaspoon of raw honey with one beaten egg white. Lightly coat under your eyes with this skin tightening mask and leave it on for 15 minutes before rinsing off. This mask is recommended for the under eye area but can be used anywhere else on the body.